Two years ago I decided to focus only on consumer-facing companies. This made me reflect on a number of things. First, the “Why”. Why is it that consumers choose to bring specific new products and services into their lives, creating new iconic brands in the process? You can read our framework on key consumer desires. Then, the “Who”. Who are the archetype consumers that most of the consumer-facing companies we see and invest in typically sell to? While there are many ways to think about that, what really struck me is that most of the startups we see are building products or services catering to the top 10% of consumers by income. I live in France where that threshold stands at EUR 37k of annual net total income. Consumers belonging to that group tend to be cash-rich/time-poor. They typically have the privilege to value convenience and user experience above price. Good recent examples of successful companies in that category would include the likes of Peloton, Deliveroo/DoorDash, Uber/Lyft, Bird/Lime. I haven’t run the maths on our dealflow or portfolio, but my gut feel would be that 75%+ of the companies we see fit into that category. This observation is by no mean a moral judgement. I don’t think that there is anything wrong with solving problems for the “top 10%” of consumers. I proudly backed several companies addressing that segment myself, and will keep doing so in the future. The point I’m trying to make here is that while it’s very rational to build and back companies aimed at that segment, it’s also missing out on a surprisingly large part of the broader picture. I’m growing particularly excited by companies addressing the needs of the forgotten “bottom 90%” of consumers. If you’re building such a company, reach out. Founders typically start a company because they have exceptional consumer insights in a given category. In most cases, they solve a problem that they personally experienced before. They build the solution they wished was there for them at the time. It’s highly rational and, in my opinion, also usually leads to better outcomes. The same goes for investors. As a VC, it’s always much easier to relate to products and services that you, or the people immediately around you, would actually use in real life. Like everyone else, investors also suffer from availability bias, meaning that we tend to overweight information directly available to us. In this case, we overweight the needs we have directly experienced as consumers. Now, let’s face it: the vast majority of founders, and virtually all investors, belong to the “urban top 10%”. And I think that this largely explains why the vast majority of VC-backed consumer startups end up addressing “urban top 10% needs”. 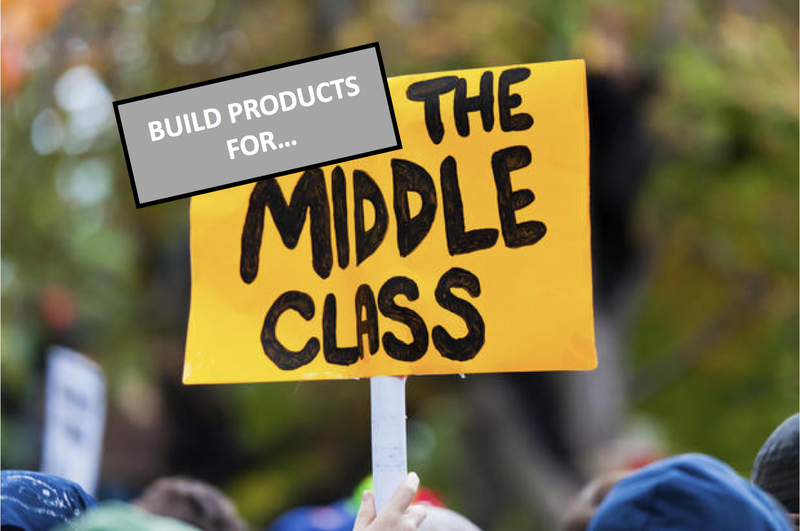 Our biases are not the only reason why we build and fund companies aimed at the “top 10%” of consumers. It’s also a great segment of the market. 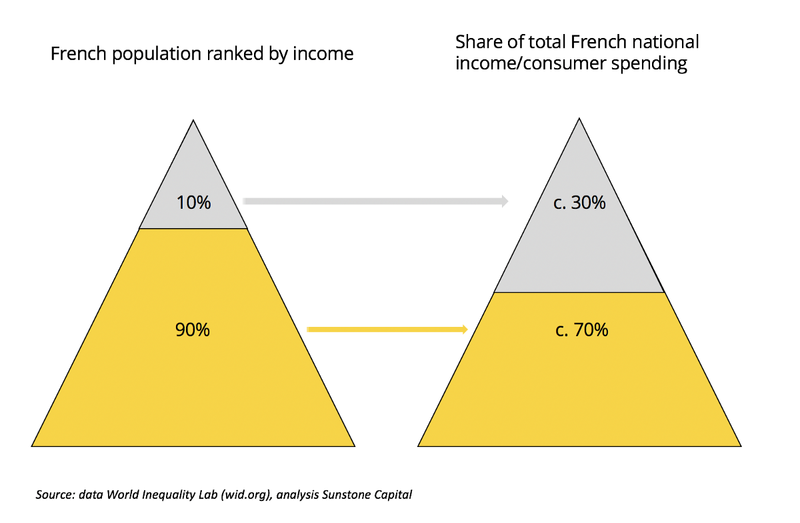 It’s large — in France, the “top 10%’ of consumers account for 32% of national income (37% in Europe). I couldn’t find comparable data on their share of total consumer spending, but I would estimate it around 30% (the “top 10%” usually also save and invest more). It’s also profitable — willingness to pay tends to be higher, price elasticity lower, and margins significantly better. Because they have more disposable income, these consumers also tend to be more able and willing to try new stuff (hence easier to initially acquire organically). This makes it a more forgiving segment to start in as a young company with little resources and without economies of scale. This is particularly relevant in capital intensive industries. Lastly, it’s also an aspirational segment and a great place to start a strong consumer brand. There’s a reason why Tesla started with the Roadster and the Model S before launching the Model 3. Here’s what I find most interesting: if the “top 10%” accounts for c. 30% of consumer spending in Western Europe, then it means that the “bottom 90%” account for a staggering 70% of it. It also feels like the lives of those consumers have been much less transformed by Technology than that of their wealthier peers in recent years. There seems to be more room for meaningful improvement. And yet, we don’t seem to be paying enough attention to the opportunity. History is full of companies who became massively successful by broadening access to entire categories of goods and services. Southwest Airlines, EasyJet, Ryanair or Airbnb allowed tens of millions of consumers to travel much more frequently than previously possible. H&M and Zara allowed just as many of them to buy fashionable, yet affordable clothes (unfortunately sometimes at the expense of workers abroad, but that’s another topic). IKEA did the same thing with furniture. Costco, Walmart or Aldi did it with groceries and basic necessities, freeing up disposable income. With their affordable “all-you-can-eat” models and free tiers, Netflix and Spotify made media entertainment a lot more accessible to the broader population. Affordability was also a key part of the Dollar Shave Club and Warby Parker stories. I’m incredibly excited by companies democratizing access to a category of goods of services, either by offering a much cheaper alternative or by reaching groups of consumers previously unreachable. Companies expressly addressing the needs of the 90% of consumers that our industry has been less attentive to. These companies can be more capital intensive and harder to build, but I think that the prize to the successful ones will also be significantly larger. I think that this thesis holds particularly true in Europe where there is a larger middle class with real spending power, and perhaps slightly less so in the US where the top 10% account for c. 50% of national income. I have recently made an investment in a French company built on that premise. This was a conscious part of our thesis. And I would love to do more of those. Reach out if you’re building a company along those lines.